Cancer was the farthest thing from my mind when I was 13 years old. I was more interested in sports and what life had to offer at that tender age. So it was a complete shock to me when my parents informed my brother and I that my dad had a rare form of cancer and that he would be in and out of the hospital for the near future. Over the next six years our family went through the hell that all families endure when dealing with this disease. It finally came to an end as I sat in history class in college and a priest came to the door and asked for me. My father passed away at the very young age of 46 in 1973. I have not been the same since. In 1986 I was training hard to move up in category while bicycle racing for the Elan Velo Club out of Salem, MA. My riding was really coming along. The miles came easy and my speed was rising every week. I was on top of the world physically. The best shape of my life. Then everything started to roll down hill very quickly. I got a call from my mom telling me she needed to go into the hospital to have a biopsy done. I was worried but felt everything would come out just fine, I was wrong. The doctor called me and gave the devastating news that my mom had inoperable cancer and there was not much they could do. Nine months later she left us way to early in life at the age of 58. The next year, 1987, my close uncle and second cousin both passed away of cancer in the same year and really just devastated our family. Coincidently, at the same time I was riding a lot in 1986, a good friend of mine Judge Sam Zoll, an avid cyclist, asked me if I would like to join his Pan Mass Challenge team. He said, you can raise the money easily, we can help with ideas and lots of support. Back then the minimum was much less than it is today it was somewhere around $1000. It scared the heck out of me so I declined Sam's offer. Little did I know at the time that Sam was one of the top folks at the PMC making it possible for the event to stop at the Mass Maritime Academy. I have thought about it almost every year since then. Sadly, Sam passed away from cancer in the spring of 2011. He will be on my mind while I ride. In the past few years my health has not been great so I really started riding and training to get better. In January of 2012 my brother-in-law was diagnosed with bone cancer and last year his wife came down with cancer as well. She just passed away in January. I said that's it, not again. The PMC jumped to the forefront of my thoughts and I signed on for a big commitment both financially and physically. I was doing great riding again, my weight was coming off and I thought I felt great. I had a gall bladder attack in December but I decided with good eating it would not happen again, well I was wrong. I had two small attacks and did not have it checked like I should have. 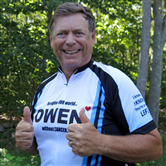 Then two days before the Pan Mass Challenge I had a serious Pancreatic attack that landed me at Lahey Clinic. It seems a gall stone became lodged in my Pancreas, it was very serious. I was devastated. I was excited to raise the $4300. and was on top of the world. Then it all came crashing down as I phoned PMC headquarters to let them know I could not ride as I was stuck in the hospital. In 2013 things were different. I started riding again and registered for the PMC as my health returned. The overlying factor was my right hip had degenerated and needed to be replaced. But I moved on and trained hard anyway. Raising the money was more difficult but I made a commitment and I knew it would all come together. Thinking of my relatives and friends who have lived with this disease has kept me going while training and writing letters. I rode the PMC in 2013 with no hip pain. It was truly a miracle (a little help from Aleve got me through). So I rode the first day just feeling great. When I got to the finish line in Bourne I was over taken by emotion thinking of my relatives that had endured so much. Day two was much the same. My riding buddy Mark Gardner kept me going and even helped adjust my right shoe as we got close to the finish. What a rewarding weekend it was. Bright sun at the finish as we took our pictures at the Inn by the water. In 2014 I was not able to ride! I had my hip replaced in March of 2014 and I felt it was not wise to ride with a large group of people with my hip on the mend. I did train however and everything went well but not a lot of miles on, about 800 miles for the season. In 2015 I was able to ride the first leg of the PMC from Sturbridge to Bourne with all the hills at the beginning. It was an awesome ride but much slower than in 2013. My training was off and I had way too much on my plate. I was not able to get in any long miles but did my 22 mile loop 4-5 times a week and I was feeling pretty good. I joined a Gloucester based team, Scrawney-Morgan which helped me out quite a bit. We also took on a Pedal Partner who lives in Georgetown - great kid who is in the battle of his life at the young age of 13. We have done a bunch of things with he and his family and enjoy them so much. It has been a rewarding experience to say the least. In 2016 I have decided to do the full boat! Sturbridge to Provincetown. 192 miles of fun on the bike. I will be staying in Bourne at the Mass Maritime Academy on Saturday night to get the full experience. So the training is in full swing and I'm way ahead of last year. That's good because I'm going to need it. 2017 I volunteered and did not ride. In 2018 I am riding the full boat yet again, what fun. My story is not much different from many of you. But it's your support that helps send millons of dollars to cancer research every year. Last year the PMC gave 100% of the funds raised (45M dollars, a record) to the Dana Farber Cancer Institute. This year we are again shooting high at $47 million. Last year we brought the total since 1980 to a whopping $500M - A HALF A BILLION DOLLARS TO FIGHT CANCER!. WOW. Now we are on track to raise a Billion in record time.